Alright stop, read this post and listen. Just Your Average Hiker’s back with a brand new addition. Sorry folks, I had to do it (and I do feel bad about it!). I was growing up with Vanilla Ice was “big”, and yes, I even went to one of his concerts…. in this post, I am not talking about Vanilla Ice however, ice cubes, iced tea, or anything like that. I am talking about ICE – In Case of Emergency information. As in a previous post this week, I discussed leaving your trip details and emergency contact information with someone when you head out-of-doors, that covers leaving information with someone else. What about yourself? If you get lost, stranded, knocked unconscious, are unable to speak, or worse in the woods, what if someone who is not with Search and Rescue who is out looking for you finds you? A lot of hikers stuff their wallet with their ID in their pack when they leave their car at the trailhead and head off into the woods. This is great, because it does provide a means of identification. However, you should go a step further. Not if you take ibuprofen for pain occasionally, but if you take it or something like it daily or have a prescription for something, INCLUDE IT! If you are taken by ambulance, they may give you something that will have adverse effects with medications you are taking. Heart or lung conditions, etc. I have a list of names, relationships to me, home and cell phones, in an order of preferred contact list. All of these people I am close with, and it would not be out-of-band for them to be contacted if there was an emergency and they could not get ahold of the Mrs. I always have my Rite in the Rain pocket journal with me for taking notes if needed, or, for leaving notes. 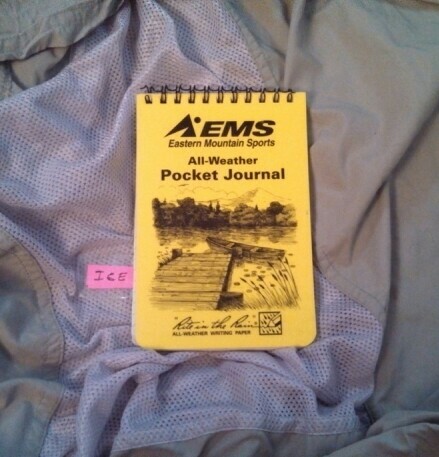 On the back few pages of this journal for years I have kept important information that is useful to me out in the woods, as well as my ICE information. I have it printed so anyone can read it, and taped to a page. As you can see below, there is also a laminated tag that sticks out to the left of the page, that says ICE, and is a bright pink color, so it is easily located. I keep this in a zip-lock baggie in the top of my pack, so it is easy to access as well, and I also let those who I hike with know where this is, just in case. This entry was posted in Backpacking, Camping, Hiking and tagged Backpacking, camp, camping, contact, Emergency, Hike, Hiking, Ice, safe, safety. Bookmark the permalink. Couldn’t agree more… our local Police Rescue in my state have a campaign called TREK. http://www.trek.nsw.gov.au – there’s a really good Trip Intention form on this site that we promote through http://www.bwrs.org.au and the cops.